Why Is Low Humidity a Problem? We measure humidity in terms of relative humidity, which is expressed as a percentage. 100% humidity is essentially rain, while 0% humidity means no moisture in the air at all. We’re usually most comfortable when the relative humidity sits between 30% and 50%. When it drops below that, the air is dry enough to pull moisture from our skin and sinuses. This results in that cracked itchy feeling on your skin, as well as making your body more vulnerable to germs and bacteria. It also creates static electricity in your home, causing those nasty shocks whenever you touch anything metal. In the worst cases, low humidity can affect the furnishings in your home, causing wood to dry out and crack, and similar issues to bedevil your efforts to keep your house looking nice. Low humidity is common in the winter because, when the temperature of the air falls, the ambient moisture in the atmosphere coalesces into liquid (and eventually solid) form, removing itself in the process. Heating systems can only crudely compensate in most cases (usually with boilers and similar water-based sources of heating), and in some cases do almost nothing to address the issue. You may be familiar with smaller humidifiers used to help you breathe when you’re sick or perhaps ensuring that certain indoor plants have a healthy environment in which to grow. A whole-house humidifier simply applies the same principles to the entire home: using your ducts or similar apparatus to blow moisture into the home in conjunction with your heating system. A fan blows across a moisture-fed wick or pad, thus added the needs moisture to the home. Most whole-house dehumidifiers can be adjusted to suit your tastes, ensuring that your home is comfortable no matter what the specific conditions are. 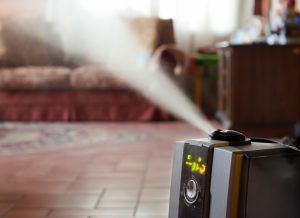 In addition to cutting down on static electricity and similar issues, humidifiers help keep the dry air from affecting furnishings and causing damage to your home. Your heater usually doesn’t have to work as hard either, since humid air tends to feel warmer, which can help ease the strain on the system and cut down on electric bills as well. But perhaps most importantly, it helps prevent the spread of germs and winter colds by ensuring that your mucus membrane—one of your body’s natural defenses against sickness—never dries out. If a dehumidifier sounds like a good fit for your Rocky River, OH home, or you already own one and would like it repaired or maintained, call the pros at Westland Heating & Air Conditioning today!